The produce section of the grocery store is a botanical disaster. Most people know that a tomato is technically a fruit, but so is an eggplant, a cucumber, and a spaghetti squash. A banana, which grows from a flower with a single ovary, is actually a berry, while a strawberry, which grows from a flower with several ovaries, isn’t a berry at all but an aggregate fruit. The most confusing classification, though, will start showing up on American shelves this month. Shoppers will find mission figs with the grapes, kiwis, and other fruit, but a clever botanist would sell them at the florist, with the fresh-cut roses. Although many people dismiss figs as a geriatric delicacy or the sticky stuff inside bad cookies, they are, in fact, something awesome: enclosed flowers that bloom modestly inward, unlike the flamboyant showoffs on other plants. Bite a fig in half and you’ll discover a core of tiny blossoms. All kinds of critters, not only humans, frequent fig trees, but the plants owe their existence to what may be evolution’s most intimate partnership between two species. Because a fig is actually a ball of flowers, it requires pollination, but because the flowers are sealed, not just any bug can crawl inside. That task belongs to a minuscule insect known as the fig wasp, whose life cycle is intertwined with the fig’s. Mother wasps lay their eggs in an unripe fig. After their offspring hatch and mature, the males mate and then chew a tunnel to the surface, dying when their task is complete. The females follow and take flight, riding the winds until they smell another fig tree. (One species of wasp, in Africa, travels ten times farther than any other known pollinator.) When the insects discover the right specimen, they go inside and deposit the pollen from their birthplace. Then the females lay new eggs, and the cycle begins again. For the wasp mother, however, devotion to the fig plant soon turns tragic. A fig’s entranceway is booby-trapped to destroy her wings, so that she can never visit another plant. When you eat a dried fig, you’re probably chewing fig-wasp mummies, too. The fig and the fig wasp are a superlative example of what biologists call codependent evolution. The plants and insects have been growing old together for more than sixty million years. Almost every species of fig plant—more than seven hundred and fifty in total—has its own species of wasp. But codependence hasn’t made them weak, like it can with humans. The figs and fig wasps’ pollination system is extremely efficient compared with that of other plants, some of which just trust the wind to blow their pollen where it needs to go. And the figs’ specialized flowers, far from isolating them in an evolutionary niche, have allowed them to radiate throughout the natural world. Fig plants can be shrubs, vines, or trees. Strangler figs sprout in the branches of another tree, drop their roots to the forest floor, and slowly envelop their host. 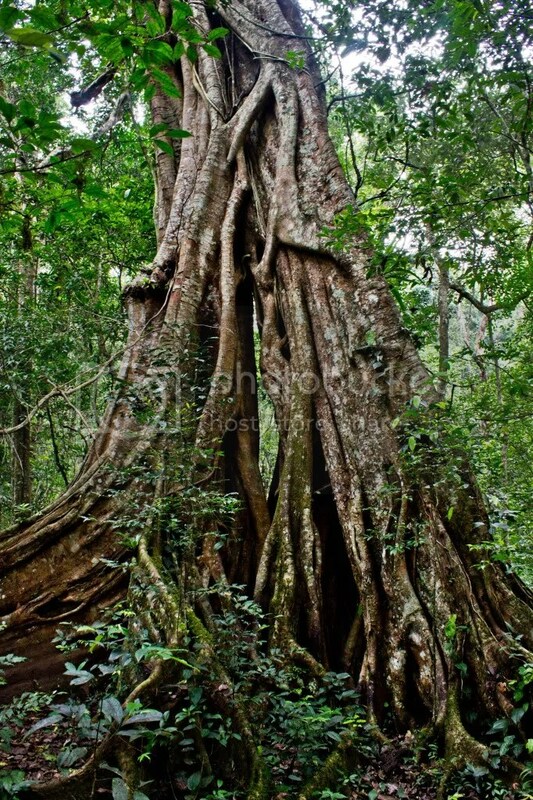 The branches of a large strangler fig can stretch over acres and produce a million figs in one flowering. Figs themselves can be brown, red, white, orange, yellow, or green. (Wild figs are not as sweet as the plump and purple mission figs you buy at the farmers’ market.) And their seeds sprout where other plants’ would flounder: rooftops, cliff sides, volcanic islands. The fig genus, Ficus, is the most varied one in the tropics. It also routinely shows up in the greenhouse and the garden.